Not that I’m complaining about taking a little break and going down to Santa Barbara for a few days. The laid-back, coastal city holds many memories for Andy and me. It was one of the first trips we took together and being there always transports me back to those early months of our relationship; both of us giddy and hopeful, excited but terrified, head-over-heels in love. I could sit and stare at these views forever. Back to reality and definitely not as much fun as a vacation: the big change. I’ve started working part-time again and I’m here to tell you, if you threw a couple kids in the mix, there’s no way Tasty Trials would stand a chance. I’ve said this so many times before and I’ll say it again: I am in awe of those of you who work, have kids, and still manage to produce amazing blogs. Just a few hours taken out of my day has shaken up my routine so much that I’m left exhausted come dinnertime, leaving good ol’ Trader Joe’s to provide us with meals that I can poke a few holes in and pop in the oven. Surely I’ll be used to this new “normal” soon enough and can get back to cooking and writing, although I do suspect it’s more a case of the grass being greener on the blogging side. If I weren’t able to blame not blogging on working I’d probably blame it on any number of other things…trashy reality television, anyone? In other exciting news, I practically squealed in delight when I saw that fresh figs had finally made their first appearance of the season at our farmer’s market. There they were, sitting gloriously in their little green baskets just waiting to be made into jam, put into tarts, stuffed with cheese and wrapped in bacon. Even better news, they resided at my favorite stall, run by my favorite vendor who is very sweet but incredibly shy, calls me “Chica” and always throws in a little something extra. I was absolutely delighted when he topped my baskets off, making them overflow. I don’t think I could be more in love with the farmer’s market. In a saucepan, combine all ingredients. Stir well. Heat to a simmer over low heat. Simmer for 30 minutes uncovered, stirring occasionally. Cover and simmer an additional 30 minutes, stirring occasionally. If desired, mash slightly with a fork once jam is done. *Note: Make sure you use a spicy jalapeno. 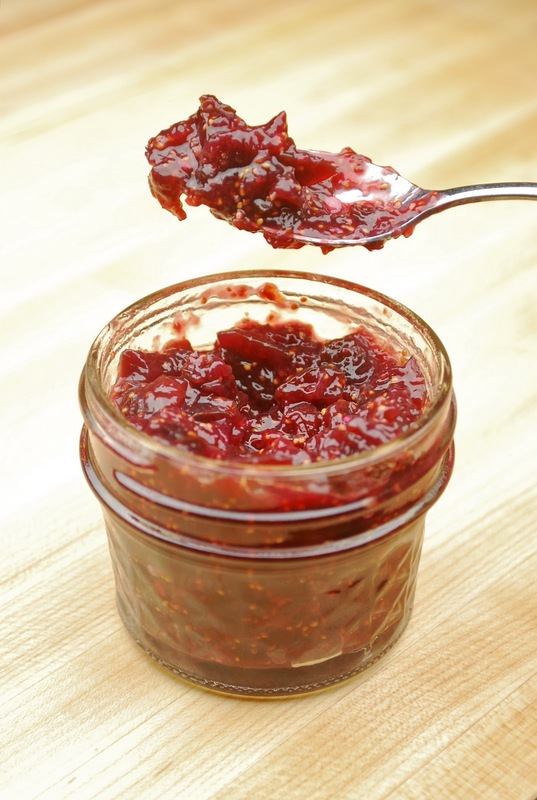 Some jalapenos taste like bell pepper and won’t give this jam the kick you’re looking for. My mom believes that I’ve burned my taste buds off and that my definition of spicy is not normal, but I really don’t think this is knock-your-socks-off spicy (take that with a grain of salt, or chili powder, if you choose). The jalapeno is subtle but cuts through the sweetness just enough for a little heat to linger in your mouth. Andy and I both thought that a little more heat might actually be nice, but then there’s that addiction rearing it’s ugly head again. 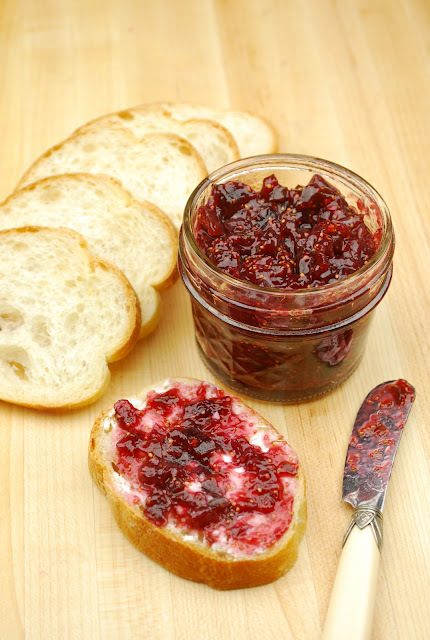 In any case, this jam is perfect just spread on crostini with a little cheese, or could be used as the “sauce” for a pizza topped with goat cheese and prosciutto. One last Santa Barbara sunrise...how can you get tired of this??? I've never been a big fan of fig preserves or fig jam, but this looks so good! I imagine the combination is awesome. Thanks for sharing! Wow! I could eat that right off the spoon. Thanks for sharing! Nice pic, good luck w the p/t job. I am very jealous. I love figs but sadly we don't get to many sweet ones here in NY. I have never had them with jalepeno either. It sounds wonderful! Ok, the ingredients in this jam are proof that you don't have kids. :) Where I added strawberries to mine; you added jalapenos. I'm jealous. I couldn't do my blog if I had a job and a child either. In fact, I couldn't do it if Dudette was any younger. If working part time and blogging brings out this kind of amazingness, keep it up, ok? Those are such beautiful figs! I like the addition of the jalapeno in the jam. I'm sure it gives it a nice kick of heat. Congrats on the job! I don't have kids and I feel the same way about blogging...so I don't know how you do it! I grew up with fig trees in the yard and have always been intimidated by them. Their dry flesh, sweetness, and mild astringency were a confusion in my mouth. I deemed figs as fruit for grown ups and left them alone. No amount of fig preserves pushed on me by grandma could change my mind. Now, 40 years later, I run across your recipe. I think that jalapeno peppers might just be a match for the fig. It just makes sense. The recipe is simple (a must for me) and could go well with savory dishes. I saw figs at my local organic market last week and, of course, didn't buy them. After seeing your intriguing recipe, I'm now thinking twice about maintaining my personal fig boycott. Karen, I don't think I've ever commented on you blog (though I do follow through Google Reader). Anyway, my husband and I *just* got back from a mini vacation to Santa Barbara! We have a similar love of SB. My husband and I first went to Santa Barbara the month after getting engaged back in 2008. It was our first vacation together, so it holds special memories for us also. Awesome regarding the job! Good for you! I love Fig Jam but have only purchased it in a jar at Whole Foods!!! This looks awesome! Can I please MOVE TO CALIFORNIA and THEN - hang out with you?! Beautiful photos, but I gotta say that jam is too cool for school! I love the idea of figs and jalapenos together....Buzzed, buzzed, buzzed! Beautiful photos!! Love the last one almost as much as I love this jame. Fig jam is one of my favorites- I have never tried a sweet spicy one! Nice, sweet with a little heat. Karen, this jam is awesome. Love the idea of the spicy sweetness! I am sure once you are more settled in to your job, you will feel like you can balance everything. i am a fig virgin... (except newtons - one of God's favorite foods on a bike ride!) i will be trying this though - One question do you peel them before dicing? Nope...no need to peel the figs, but if they have a stem, cut it off. Hope you enjoy your first non-newton fig experience! I hear you. Funny that my latest post is entitled the BIG change haha... i guess a lot of us are undergoing so many changes and are busy with our lives. I am with you, I am also amazed with those people who are on their toes with blogging, tweeting and facebooking... well not for me, I've been away for awhile but yeah I'm glad to have the time to day to catch up with my fave food blogs. Congratulations on the new job. I hope you'll find your balance soon. This looks amazing. Perfect pairing with cheese. Can't wait to try this. This is delicious! Thank you. I've made a sweet jam spread, with a dash of brandy. But heat & sweet sounds wonderful! I might try some made with a spicy pepper -- the fruit flavor of a habanero might be good with this if you an stand the heat! Your jam sounds great. I just made some balsamic fig jam and it came out rather boring. I wish I had added some jalapenos for some kick. Funny that going to work has interfered with your blogging. I quit my job and haven't posted in months! This is some GORGEOUS jam...I'm a new fig convert, so I'm always looking for new ways to use them. Dried or fresh, they're both yummy! Yum! What great jam that I have to try. Love that coast pic!!! Beautiful Photos! The fig & Jalepeno jam looks amazing!! I bet this is absolutely awesome with fresh french bread and prosciutto. Figs are a funny thing and the season for them (where they're really at their peak) is relatively short, and almost non-existent on the East Coast. I might have to give this recipe a try over the weekend. Yum! That jam sounds so delicious. I love the spice too! I am so jealous of your farmer's market and trip to Santa Barbra, it is beautiful there. I can imagine the sweet & spicy. Looks amazing! The way this is written makes me think it is for a refrigerator jam...Do you know if I could safely process these in a hot water bath and preserve them? Hi Judy, You're right... this is refrigerator jam. Unfortunately, I don't know enough about canning to say whether you could preserve these long term with a hot water bath. Sorry about that. I have a fig tree in my yard, with ABUNDANT figs this season! I've made many pints of fig preserves with ginger so far, and was thinking my next batch needed a little kick to it. First thought was some red pepper chili flakes, but as I was looking at the jalapenos I had just picked this morning, bells went off! So glad to know that my taste buds aren't crazy! Thanks for sharing the recipe... will be making this with this morning's harvest! he Dean of Students and Associate Deans serve as advocates, advisers, and problem solvers for all students at Carleton. he Dean of Students and Associate Deans serve as advocates, advisers, and problem solvers for all students at Carleton.